Extra virgin olive oil is good for cracked and chafed skin, and is especially soothing for a baby’s diaper rash. One of my grandmother’s old family remedies is a truly magical ointment that’s very easy to prepare. Mix 2 teaspoons of EVOO with 1 teaspoon of water. Whip/froth the water and olive oil together until an emulsion appears. Spread it on the baby’s bottom after a bath or before putting on a clean diaper. Cradle cap is a form of Seborrheic Dermatitis (a type of dandruff) often seen in newborn infants. Your baby may just have a mild case of this dry, flaky skin or it may be a more severe case marked by thick, oily yellow patches. Throughout the centuries, mothers have found many ways to treat this condition, but one of the most noted of home remedies for alleviating a baby’s cradle cap is to use olive oil. Gently massage your baby’s scalp with extra virgin olive oil (with your fingers or a soft baby brush). Leave it on for at least 10 minutes. Then gently wash and rinse the baby’s head with warm water. If you have never given your new baby a massage, you have missed a really great treat. It has been proven that human touch not only helps an infant to bond with a parent but it can also build trust between mother and father and baby. Both you and your new baby will benefit from the time spent in this wonderful pursuit. Just watch your baby giggle and coo with enjoyment when you give her or him a soothing olive oil massage. Rub extra virgin olive oil into your hands to reduce the friction on your baby’s skin. Make sure that the room is warm. Use gliding strokes or circular motions and press ever-so-gently. Don’t forget the baby’s fingers and toes and take special care if you massage the baby’s head (you may wish to avoid that “soft spot”). 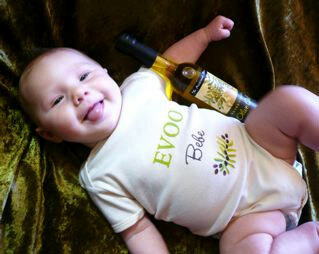 Of course, used internally, olive oil is the “good fat” for babies, as well as adults. So convinced are they of the many health benefits of olive oil, people from the Mediterranean area for centuries have often spoon-fed it to children, starting at around five months old, as a growth supplement. Olive oil contains Vitamin A and, along with its high percentage of oleic acid, is reported to stimulate bone growth and encourage the absorption of calcium and minerals. It also helps with gastritis, a problem with many infants and young children. To the rescue – nature’s natural remedy - extra virgin olive oil. It acts to coat the delicate stomach lining of the baby or young child and aids in the digestive process. Of course, always check with your pediatrician for questions or advice for your baby’s health. And remember, vive l’huile d'olive!